For 20 years the Studio Gallery in Somerset has represented a growing group of highly talented and original sculptors, whose figurative work is designed for both gardens and interiors. This year's VIEWS FROM THE HILL exhibition at the Studio Gallery in Somerset is previewing sculptors and makers and makers who are regular Chelsea exhibitors. Plus ceramics, painting, print and vintage collectables, full details of everyone taking part in this year's VIEWS FROM THE HILL can be found in the exhibitions page of this website. We now have available the complete range of work by Rosemary Cook. 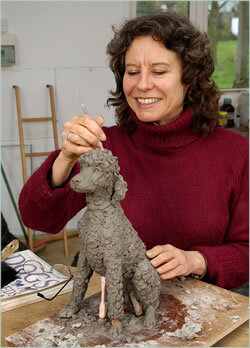 Mold-making and casting in bronze resin for sculptors at Studio Gallery Casting in Somerset.